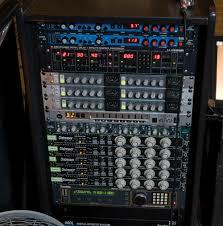 The debate over digital vs analog consoles has well and truely been won by digital at the high end of the spectrum. The days of large outdoor concerts using heavy copper snakes are well and truly over due to the massive cost and time savings that can be made with digital consoles. At the lower end of the market, in the pubs and clubs across the world, the war is still waging and manufacturers are still churning out millions of analog desks every year. The scales are certainly beginning to tip towards digitals favour, but there may still be times when an analog desk is the best solution for the job. Digital desks have gotten a lot cheaper over the last couple of years, but when should you consider one? Whenever you think you might need to connect more than two external processors to a mixing desk, a digital desk will likely be a better and cheaper option. If you just plan on using the desk as is with no external devices and maybe a few on-board effects, then a good analog console may be your best bet. However, if you plan on connecting more than two of the following devices (collectively referred to as "outboard) then digital may be the way to go. Digital mixers have these external devices built in and as a result can save you a lot of money when purchasing a system. The total cost of the actual mixer is often more than an analog one, however the cost of the outboard devices often tips the equation back into digital's favour. Aside from cost, if you ever use a "Soundman" out the front in the audience, a digital desk with a digital snake may save you hours of setting up and pack-down time. Recall - you can save your settings and recall them whenever you want. Security - you can lock the desk, or portions of the desk to avoid tampering. Control - You can often mix using an iPad or laptop for monitors or for "walking the audience"
Updates - Manufacturers release new features regularly as firmware updates. Flexibility - Digital systems can often be configured and optimised for different tasks. Failure points - there are usually fewer individual failure points, but more catastrophic points of failure. With digital if something fails, generally the whole system dies. Old School Factor - Some people (typically older sound engineers), think Digital does not sound as good, or prefer the highly tactile and proportional interfaces of analog systems where each knob has one function and one function only. Obsolescence - With analog, a 20 year old desk can still be plugged into a 2 year old sound system. In the future, as Digital becomes more ubiquitous, new digital interfaces may not be compatible with old ones. There is currently no right or wrong answer on whether to go digital or not, there are still some great analog consoles out there and users need to choose the right tool for the job and that suits their own working preferences and budget.